Ticket does NOT include a reserved seat in designated grandstand. Pass good at all four Super Photo locations and Pit Lane Area at specified times. Video recording and cine photography is PROHIBITED in restricted areas. Not good for any media photo areas including trackside. Time limit of 30 minutes per person per location will be enforced. You’re free to rotate from location to location while still observing the thirty-minute limitation. Must have a camera to gain access to the photo locations. Signing of Waiver Release and obtaining a wristband is REQUIRED at Pit Gate prior to first entry into Pit Lane. No drones/RC aircraft allowed on premises. The credential holder is required to leave the pits, photo locations or any restricted area upon request of authorized personnel. The Super Photo Ticket credential constitutes a revocable license. 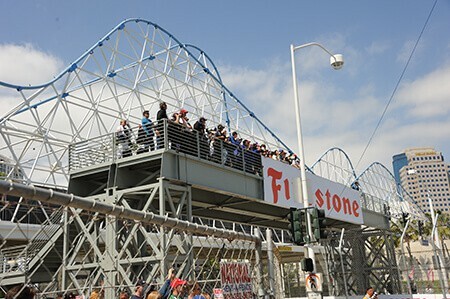 Turn 1 (at the “Roller Coaster” bridge, shown below left) — A shared location with media covering the event, the Turn 1 bridge offers a look straight down the high-speed Shoreline Drive as the cars gear down for the hard left-hand Toyota Turn. Located on the bridge span across Shoreline Drive. Access via stairwell near Aquarium parking garage. Turn 6 — At the end of the short chute running from Turn 5 to Turn 6. Elevated photo stand located drivers’ right in Turn 6. Access near base of Tecate bridge. Turn 8 — On the inside of the turn as the cars brake for a right-hand turn onto Seaside Way. Located in a secured area, drivers’ right, in Turn 8. Access from ground level in front of Pine Ave. parking garage. Turn 11 — Outside of the turn, as the cars brake hard and set up to enter high-speed Shoreline Drive or enter the Pits. Elevated photo stand located drivers’ left. Access from south side of the track. Personal video cameras for NON-COMMERCIAL USE ONLY are permitted in unrestricted areas. Not responsible for lost or stolen tickets or Vision Board failures. Super Photo tickets do not include a reserved seat. Everyone, regardless of age, must have a grandstand ticket for grandstand seating. 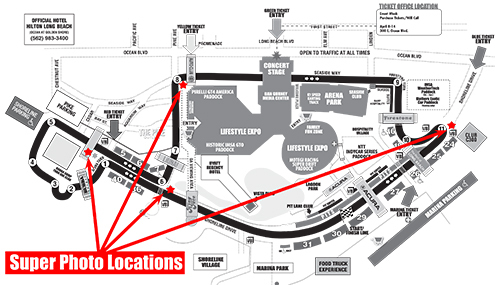 For parking and ticket information, call the race ticket office at 888-827-7333.